BROOKLYN, N.Y. – The longer students attend Brooklyn Laboratory Charter School, the better they do. Many enter in sixth grade performing years behind grade level. By the end of middle school, though, they’re doing better than their peers in District 13. And that’s despite the fact that nearly 30 percent of Brooklyn Lab’s students have disabilities that qualify them for special education services – double the portion of students in District 13 who do. 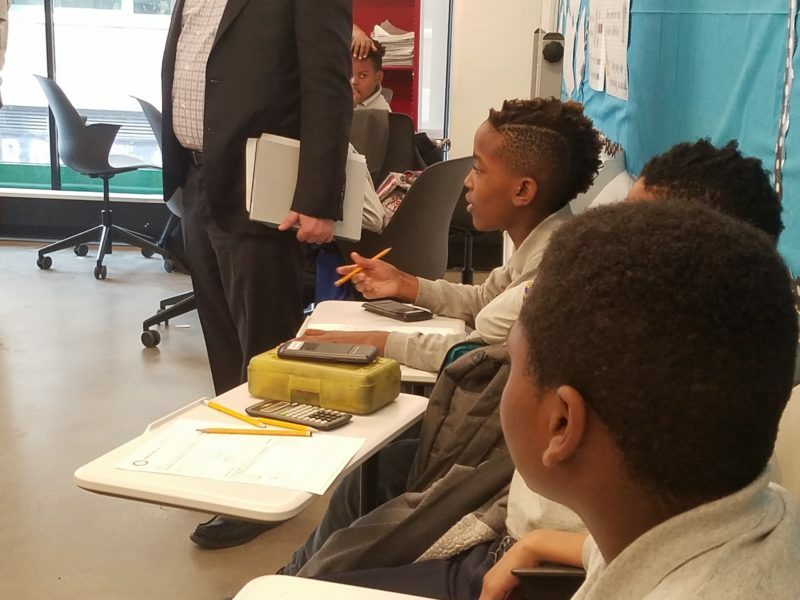 Brooklyn Lab, which opened in 2014 and serves students in sixth through 10th grade on its way to expanding into a full high school, stands out in a charter sector that has been criticized for pushing out students with complex learning needs. These students may need more time and help from teachers, and they may not test well, thus bringing down a school’s overall performance, which can threaten a school’s reputation and even charter renewal. This five-year-old school in downtown Brooklyn – which has students in sixth through 10th grade on its way to expanding into a full high school – has developed a reputation for serving children with learning disabilities, in part because of its commitment to personalizing learning. All students progress at their own rate, not in grade-by-grade lockstep. Teachers get the training and information they need to give all students targeted, individualized supports. That’s the way special education was designed to work. And at Brooklyn Lab, the historical expertise from the special education field finds a logical home in the more recent trend to customize learning. Olubunmi Aweldwa’s son is a sixth grader at the school this year. In other schools, she said, she got the impression teachers found her son difficult to work with and wanted him to transfer. Aweldwa’s son transferred from District 75, the citywide district that exclusively serves kids in special education. At the beginning of the year, Brooklyn Lab assessed his capacity in reading and math and found him to be performing at a first-grade level in English language arts. By the beginning of January, his proficiency had jumped to the mid-third-grade level. In math, he grew from the second- to the fourth-grade level in the same timeframe. Helping students achieve such growth is personal for Eric Tucker, co-founder and director of the school. Tucker’s learning and attention issues weren’t diagnosed until college, when he found out he had attention deficit hyperactivity disorder, dyslexia, dysgraphia and language acquisition delays. Tucker and his co-founder and now wife, Erin Mote, designed their school to be as broadly supportive as possible. Every student gets small-group instruction for two hours each day. While in other schools, students may face a stigma for getting extra attention, it’s the norm at Brooklyn Lab, whether students are behind or not. Because students spend so much of the day in small groups, educators have plenty of opportunities to coach students who are behind, without making it obvious to their peers that they’re doing so. “We avoid the optics of having kids being pulled out of a full-group classroom,” Mote said, adding that this can be particularly important for image-conscious middle-schoolers. It’s possible to have so much small-group time because Brooklyn Lab has extra adults in the building. Thanks to a teacher residency and a fellowship program, it has enough instructors to have every class be co-taught. These programs have the added benefit of creating a pipeline of certified teachers who get trained in Brooklyn Lab’s philosophy. Core to that philosophy is the idea that everyone has jagged learning curves. Some students excel in one subject while struggling in another, or they excel in math, generally, but haven’t yet mastered spatial reasoning, for example. Teachers at the school operate with the understanding that all learners have strengths. “We focus on strengths and build on areas where they have gaps,” Tucker said. In the school’s first year, Mote built a data system called Cortex that allows teachers to track how students do on individual standards across every subject and grade level. The system also serves as a platform for students to complete assignments teachers select specifically for them, based on their skill level on any given day. Through a separate nonprofit, InnovateEDU, Cortex is now used by 30,000 teachers, students and administrators from around the country. Through easy-to-read data dashboards, teachers can see what standards students have mastered and whether their learning trajectory is trending in the right direction, plateauing or on the decline. Greg Rodriguez, a school director in one of Lab’s three buildings, said the focus on such granular data can be motivating for teachers, particularly in working with students who are years below grade level. The focus on foundational skills that support grade-level performance is one reason why its older students perform relatively well and why students’ growth scores are so impressive. Lab also requires mastery from students. The cutoff for passing is higher than in traditional schools. That requires more work from students, but Amir El, a ninth grader who has been at Lab since sixth grade, said the grading system is more honest. Other schools, he said, pass students who just scrape by with a 60 or 70. The focus on mastery aims to avoid sending students on to more advanced work before they’ve learned the prerequisite material. Besides the extra one-on-one or small-group support, students get a longer school day and year to work at achieving mastery. And Lab teachers urge them to rise to the challenge; the rigorous, college-prep curriculum aims to prepare all students for advanced coursework. Of course, personalized instruction is key to making that possible. This story about the Brooklyn Lab School was produced by The Hechinger Report, a nonprofit, independent news organization focused on inequality and innovation in education.